Structure of the posterior part of the eye - Visual Dictionary - Copyright © 2005-2016 - All rights reserved. [img]https://infovisual.info//storage/app/media/03/img_en/047 Structure of the posterior part of the eye.jpg[/img] [url=https://infovisual.info/en][/url] - [url=http://www.infovisual.info/]Visual Dictionary[/url] - Copyright © 2005-2016 - All rights reserved. 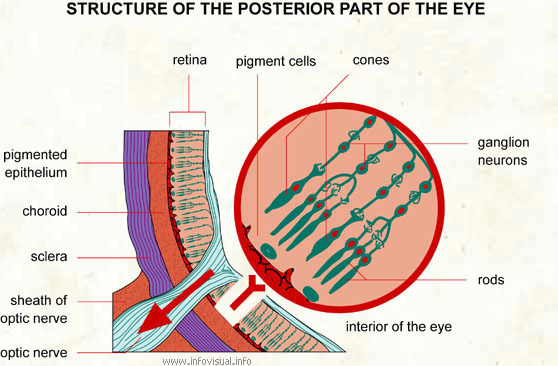 Structure of the posterior part of the eye: part of the organ of sight comprised principally of the eyelids, the eyelashes, the lachrymal gland and the eyeball. Retina: eye membrane composed of nerve cells. Pigment cells: part of the eye containing pigments. Cones: short, compact visual cells. Ganglion neurons: nerve cells of the eye. Rods: long, fine, visual cells. Interior of the eye: inside of the eyeball. Optic nerve: conductor of nerve impulses in the eye. Sheat of optic nerve: envelope containing the nerve related to sight. Sclera: outermost membrane of the eye. Choroid: middle membrane of the eye. Pigmented epithelium: part of the eye containing pigments. Eyes are organs of vision that detect light. Different kinds of light-sensitive organs are found in a variety of organisms. The simplest eyes do nothing but detect whether the surroundings are light or dark. The visual fields of some such complex eyes largely overlap, to allow better depth perception, binocular vision, as in humans.